The fruitcake bears the brunt of many holiday jokes in forums as varied as the Sunday funny pages and boxes of greeting cards. One entrepreneur manufactures fruitcakes—and sells them for use as doorstops. Yet the fruitcake has historical associations with the Holy Land, and its internal bounty is said to represent the gifts of the Wise Men. Like many other fruit breads and cakes, it has been venerated since Medieval times when fruit in the wintertime was an extraordinary treat. Modern fruitcakes are based on traditional recipes that are cherished among families, but, thanks to mail-order catalogues and a wide variety of fruitcakes among manufacturers, new twists for this familiar friend abound. History and lore mingle in the retelling of the fruitcake story. The ancient Egyptians made fruitcake for their departed loved ones to carry with them to the afterlife. The dense cake and preserved fruit were thought to withstand the journey, and the riches of the fruits and nuts communicated the wealth of the consumer and the family's esteem for their relative. The Middle East overflowed with the variety of dates, citrus fruit, and nuts that were virtually unknown in Northern Europe until the Crusades. Returning Crusaders brought fruit with them, but the trade that was initiated was frequently interrupted by war, and, of course, the fruit was highly perishable. These dilemmas were partially solved by drying or candying the fruit for travel, and, when the fruit reached Northern Europe, it was shared by mixing it in breads and cakes. Because the fruit came from the Holy Land, it was also revered and saved for feast days, particularly Christmas and Easter. The Austrians reencountered the bounty of Middle Eastern fruit when the Turks lay siege to Vienna in the seventeenth century. In gratitude for having survived that face-off, the Viennese served German turban cake, or gugelhupf, with its filling of raisins, citron, lemon and orange peel, almonds, and spices on Christmas morning. Similarly, the Scandinavians bake fruit breads and cakes variously called julekage, julekakke, or julebrod at Christmas time; like fruitcake, these contain fruits, nuts, and exotic spices and are glazed. The German Christmas bread called stollen and the Italian holiday bread known as panettone are other close kin for the fruitcake. They are characterized by variations in the bread or cake base, choices among fruit and nuts (panettone, for example may be baked with pine nuts), and the optional addition of rum or brandy. Italian panettone is a Milanese tradition surrounded by legend. Supposedly, eggs and fruit were used to make bread for the poor only at holiday times. Panettone became associated with the unification of Italy during the uprisings of 1821 when the traditional raisins were replaced with red cherries and green citron to represent the Italian tricolor flag. Still other similar traditions are Russian Easter bread, known as kulich and topped with lemon icing, and Irish fruit bread, which is called barmbrack, and accompanies Halloween and All Saints Day festivities. First, the dry and liquid ingredients are mixed separately. Once mixed, they are combined and fruit and nuts are added. exploded into colorful, season-long celebrations. Fruitcakes (and other fruit-bearing holiday treats like the plum pudding and Irish plum cake) were made well in advance of the holidays. The cakes were wrapped in cheesecloth that had been soaked in brandy; periodically, the cheese-cloth was resoaked and the cakes rewrapped to absorb the liquid. The day before Christmas, the cakes were unwrapped, coated with marzipan or almond paste, further coated with royal icing that dried and hardened, and then glazed with apricot glaze. These Christmas cakes demonstrated such abundance that the same kind of cake is used today in England as wedding cake, and it has the advantage of preserving well for anniversary celebrations. Fruitcake character is largely determined by the wealth of fruit and nuts it contains. These can include a whole range or be limited to selected fruit or nuts, depending on the recipe, taste, or market. Fruit can include lemon and orange peel, raisins, dates, currants, figs, apricots, cherries, citron (the preserved rind of the citron fruit, which is similar to a lemon), and pineapple. These fruits are all preserved, dried, candied, or glazed so that much of their natural moisture is removed, and they will keep longer. The cherries and pineapple in particular may also be colored with food coloring. Nuts include walnuts, pecans, almonds, and pine nuts; broken pieces are incorporated in the cake, but walnut or pecan halves may be used to decorate the outside. Most fruitcake bakers purchase fruit and nuts from specialty manufacturers or suppliers. The batter is poured into cake pans and baked slowly. which rum and brandy are the most popular. The cake itself is made of high-quality flour, salt, baking powder, brown sugar, and butter. Again, these ingredients are purchased directly from suppliers. 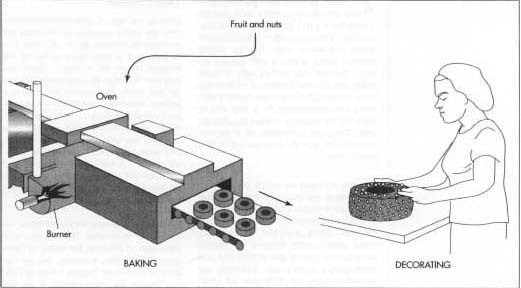 The choice of fruit and nuts to be included is subject to availability and the taste of the baker. The spice blend for most manufacturers is carefully guarded, and the proportion of cake to fruit is also a design choice. 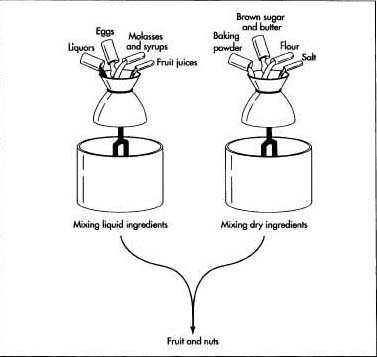 Ideally, the cake is delicious by itself, but its molasses and brown sugar ingredients (not common to other cakes) are added to help the fruit stick together with the cake as a minimal matrix. Rum and brandy leave their flavor but no alcoholic content because the alcohol is driven off during baking. While these potent potables are flavorful, the choice of making fruitcake intoxicating rests with the consumer who can adjust the cake's moisture level by wrapping it in soaked cheesecloth. If the consumer chooses to do this, any favorite liquor flavor, such as wine, fruit juice, liqueurs, or the traditional brandy or rum can be used. The designer may also select the shape of the fruit-cake. Collin Street Bakery, the largest producer of fruitcake in the world, prefers a ring shape, while circular and loaf-shaped cakes are also manufactured. In the bakery, the liquid and dry ingredients are mixed separately and then blended together. In large bowls, a generous proportion of fruit and nuts is mixed with the cake dough until the surfaces of the fruit are coated. The rich mixture with its sparkling cherries is scooped into baking pans lined with greased paper that prevents the sugary fruit from burning against the sides of the metal pans. The pans and their contents are weighed to produce uniform products, and the pans are placed on conveyor belts that carry them past a team of inspectors. The inspectors watch for excessive variations and arrange the nuts and cherries so they show to best advantage. The fruit and nuts will not move in the cake once they are in place, so the appearance of the cake before it is baked will be much the same as the finished product. The cake pans that have passed inspection are placed on large trays that are loaded into a 5 ft (1.5 m) tall industrial baking rack. The entire rack is rolled into a rotating convection oven for the baking process, which is also a well-guarded secret. Because this type of cake is dense rather than airy and because of the fruit and sugar contents, fruit cakes are baked at relatively low temperatures for a long time to drive off the moisture without singeing the fruit. The racks are wheeled out of the convection oven, and the cakes are left in their pans to cool. After the cakes are cooled, they must be wrapped and packaged quickly before they begin to reabsorb moisture from the air. The cakes are removed from their pans, and the paper lining is striped off the cakes. Some manufacturers decorate the finished surfaces with sugared nuts or extra fruit, and some apply a syrup glaze. Following any decorative steps, the fruitcakes are packaged, usually in an inner wrap of decorative cellophane that is seated on a lace doily and a piece of fruitcake-sized cardboard. This inner set of packing is placed in a box or ornamental tin and sealed. That container may also be sealed in an outer box for store display, mailing or shipment. Quality control begins with the selection of ingredients including the most beautiful candied fruit that should be free of discolorations and tough pieces and should shine like the colors in a stained glass window. Spices and liquors are the other ingredients that give flavorful character to the fruitcake, and they must be fresh and true to their flavors with no sharp twangs or bitterness. During the mixing processes, the ingredients, mixtures, and machinery are monitored carefully. The fruitcake bakers take tremendous pride in their product and scrutinize its quality. The inspection team along the assembly line prior to baking performs the most detailed check while arranging the surficial nuts and fruit. The cakes are inspected again as they are packed, but, after the fruitcakes have been baked, they are virtually indestructible and will last years if kept in cool, dark storage. Even in our age of cholesterol-consciousness and health concerns, the fruitcake has an upwardly trending future. If a diet is to be broken, it is most likely to fall by the wayside during the holidays. Fruitcakes may bear the brunt of many jokes, but they are still firmly implanted in our collective holiday traditions. Fruitcakes are also an adult and acquired taste, not only because of the liquors but because of the complex blend of spices and other flavors that usually appeal more to grownups. Collin Street Bakery makes 1.6 million fruitcakes per year and ships this product, totaling four million lb (approximately two million kg), to customers in all 50 states and 200 countries. Several monasteries in the United States, including the Assumption Abbey in the Ozark Mountains of Missouri, the Abbey of Gethsemani in Trappist, Kentucky, and the Our Lady of Guadalupe Trappist Abbey in Carlton, Oregon, are recent entrants in the race to produce the best fruitcake. The 14 monks of Assumption Abbey create 23,000 fruit-cakes per holiday season to finance their less worldly vocations. Furthermore, fruit-cake baking doesn't require much conversation, so the monks can maintain their vows of silence while fully supplying customers by mail order and e-mail. Fruitcakes, therefore, may also help us maintain a connection with the religious origins of holidays in these commercial times. Bailey, Adrian, ed. Mrs. Bridges' Upstairs, Downstairs Cookery Book. New York: Simon and Schuster, 1974. Cosman, Madeleine Pelner. Fabulous Feasts: Medieval Cookery and Ceremony. New York: George Braziller, 1976. Field, Carol. The Italian Baker. New York: Harper & Row Publishers, 1985. General Mills, Inc. Betty Crocker's International Cookbook. New York: Random House, 1980. McGrath, Jean. Butte's Heritage Cookbook. Butte, MT: Butte-Silver Bow Bicentennial Commission, 1976. Morris, Sally. British and Irish Cooking: Traditional dishes prepared in a modern way. New York: Garland Books, 1972. Abbey of Gethsemani. http://www.monks.org/abbey-pg.htm . Collin Street Bakery. http://www.collinstreetbakery.com/ . Harry and David. http://www.harryanddavid.com/ . Southern Supreme Nutty Fruitcakes & Gourmet Confections. http:/lsosupreme.corn/ . Sunshine Hollow Bakery. http://www.sunshinehollow.com/ . I am a longtime purchaser of ur fruit cakes at Christmastime. A friend just sent me one in sealed box and in tin properly wrapped, etc.